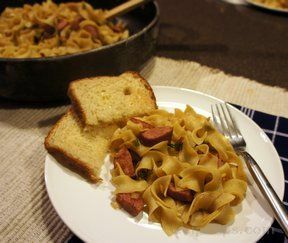 This was something different for us, it is very good and very flavorful! Cook one package of Italian sausage according to package directions. Bias-slice and keep warm. Slice peppers and onion into Julienne strips and set aside. In a large pan add olive oil and garlic and sautÃ© for about 30 seconds. Add vegetables to oil and garlic and sautÃ© an additional 5 minutes or until crisp tender. 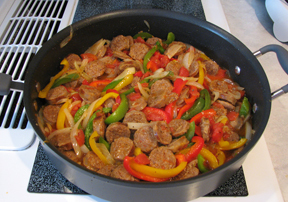 Add tomatoes and sliced Italian Sausage and heat through, seasoning to taste with salt and pepper. I served mine with rice cooked in chicken broth. "Very good! I used spicy sausage and it was to hot for the kids. DH and I loved it though! Thanks!"